This HP C9700-04A Compatible Toner Cartridges & Drum Unit Combo Pack from InkTonerWeb.com includes 4 cartridges & 1 drum: C9700A , C9701A, C9702A, C9703A, C9704A (Black, Cyan, Magenta, Yellow, Drum). These HP C9700-04A compatible toner cartridges & drum units are guaranteed to perform with your HP Color LaserJet 1500, 1500L, 1500Lxi, 2500, 2500L, 2500n, 2500tn printer. 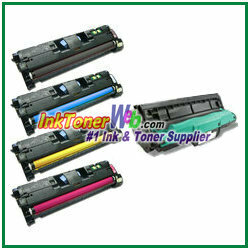 They replace the original HP C9700-04A toner cartridges & drum units. Our compatible (generic) replacement HP C9700-04A laser toner cartridges & drum units are made in ISO9001 & 14001 factories and meet the highest standards of quality, reliability and exceptional yields, offering high-quality printing results as OEM HP C9700-04A toner cartridges & drum units.